Passing and moving. Must be one touch and as fast as possible. A great drill for awareness on and off the ball. (B) passes to (A) then runs to the free cone the top right of the square. This one is easy to do on and off the ball. Passing and moving. Must be one touch and as fast as possible. Here (B) passes to (A) and moved to the free cone. (A) passes to (C) and moves to the free cone. Observation must be away from the ball to see where the free space is BEFORE receiving the pass. (B) Really MUST have good peripheral vision on this one as the free cone is the one directly behind now. (A) is the only player who moves off the ball as play is going on in this phase. As (B) is passing, (D) and (A) have moved so (B) must be observing this as he or she is receiving the ball to therefore recognize where the free space. This requires not one but two looks. In fact the more looks the better if its possible in the short time span. Originally as the pass was coming to (B) the free space was at the top left. 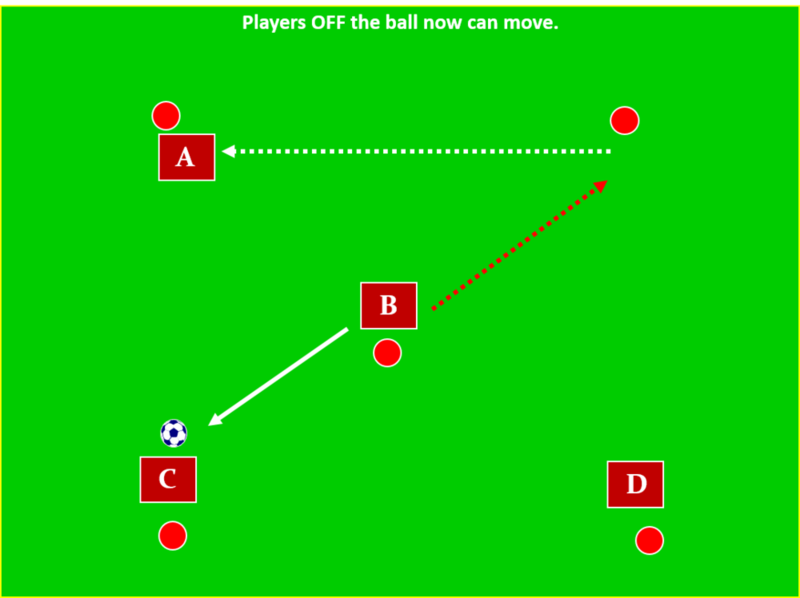 With movement OFF the ball it has now become the bottom right due to the movements of (A) and (D) off the ball. Now the free space is in the middle. (B) Really MUST have good peripheral vision on this one as the free cone is the one directly behind now. As a coach you are looking for players who pass them to assess the free cone / space afterwards and not before which will show up as a hesitation in movement by the passing player. We want them to pass and already be moving to the free space. They allow a flow rate to happen regarding PASSING and SUPPORT and help players to develop CONFIDENCE and COMPOSURE on the ball. Development can be monitored and progression can be clearly judged and the coach can move the players onto the next level when they recognize the time is right. I have carefully developed the levels of progression of these sessions to ensure each level is addressed at the correct time. Look over shoulder before receiving (where you are passing to). Body Stance – half turned (can see behind). Save a touch – let weight of ball determine this- let it run across the body and move one touch. Develop - Opposite player stays or closes the middle player down. If closed down, middle player passes back to same. If not closed the middle player turns and passes to opposite player. Go through each progression in the order it is presented here, do one at a time and have each player practice it in the middle at every stage of the progressions. Begin by passing the ball from (1) to (2) to (3) and back (2) Receives and turns and passes. Passing must be sharp and accurate, one or two touch. You can receive with the furthest foot away from the passer and pass it with the nearest foot, or save a touch and move it one touch with the inside of the nearest foot or the outside of the furthest foot. Let the weight of the pass determine this, let it run across your body and move it one touch. The player in the middle must open their body stance up by going side on so they can see what is behind them and it makes it easier to receive and pass the ball on. The opposite outside player from the ball can decide to close down the middle player or stay away. If they close down then the middle player must pass the ball back to the player who passed it to them. If they stay in position then the middle player passes the ball to them. This highlights if the player has looked to see where the other player is before receiving the pass. Put a passive defender in with the middle player to show how they run them off to check and lose them. Now working on the movement of the outside player to create a bigger angle to pass and receive the ball. Above (2) passes to (1) who moves the ball into space with a good first touch to then pass the ball back with a second touch. The movement is shown below. Likewise (3) receives and moves the ball off at an angle and the cycle continues. Look over the shoulder to see what’s behind, do this before receiving the ball not after. Position in the middle off at an angle to receive, this makes a triangular support position and opens up the field of vision. Once the ball has been passed on the middle player moves to the other side off at an angle again (can use cones to run to both sides). This forces the players to receive and pass with both feet. Now encourage players to do a DOUBLE LOOK. First when moving from one side to the other to see what is happening as the player is moving and then 2nd when as the player arrives in position. Reason being as the player moves from one cone to the other the situation may have changed in the game itself so as the player arrives in position and just before the ball is played they do the 2nd look to update themselves MENTALLY on positioning of team mates, defenders and where the space is around them. Moving short to receive the pass; in a game it is getting away from the defender to receive in space with time on the ball. Keep the angle wide so you can still receive the pass side on, if you move short but more central you will receive the ball more with your back to the play with less room to work the ball in. Develop by the middle player moving away from the ball to take a defender away from the space and then checking back to receive the pass in time and space. With these movements the passer must be aware of the receivers movements to get the timing of the pass right. The receiver must be aware of how quickly the passer has control of the ball and is ready to pass it to get the timing of the run right (therefore always looking). These movements in a game are dictated by how much time on the ball the passer has, if no time then coming short to receive the first pass, if time on the ball then the receiver can run a defender off the check and receive to feet. Working on the middle player again, if they are marked in a game look to come short to receive the pass to get away from the defender. Regular Rondos are great; and this one encourages players to rotate in and out as the ball is moved. So always looking to change positions off the ball and every player gets the chance to be the PIVOT player. 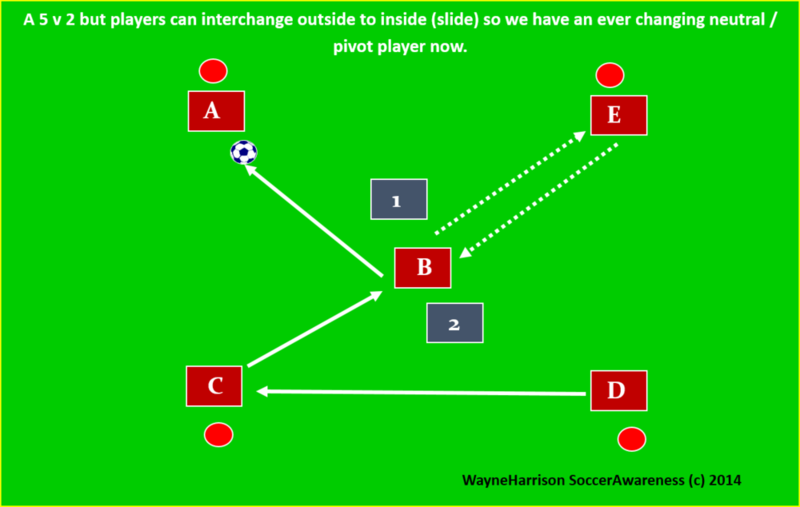 Eventually ALL players on attack can move and interchange, outside to in, inside to out and outside to outside. If defenders win the ball they try to keep it. Defending players stay in for one minute then change with outside players. Very fast tempo playing ONE touch where they can. We must play into the central neutral pivot player as often as possible. Do this one with no movement or rotation of players to begin. Very fast tempo playing ONE touch where they can. Here (E) slides outside and (B) slides inside on the blindside of the ball and (D) makes a one touch pass to (C) who immediately passes to (B) to then pass to (A). Players must slide in and out as often as they can to keep the momentum going. Now we have movement off the ball in the 4 square as well as the pivot player. (C) passes to (B) the pivot player. Off the ball (E) has moved to (D) and (D) to (C) so (B) has to move to (E). (C) moves to be the pivot player. So (B) is passing to (A) but needs to scan around and behind to see where the free space is. Now the ball is with (A) and the cycle of passing and moving, on and off the ball continues. Can pass around the square also but challenge yourselves to work with the pivot player in the middle where defenders are. Four FAST decisions to make here based on the movements of the outside players. Testing the LOOK behind, early positioning of the feet and body of the testing player as the ball is arriving in the middle. Outside players can pass around to each other with the central receiving player (E) waiting to see what action is taken. More difficult now because EVERY pass is accounted for in terms of (D) having to make a decision and going both ways. (C) passes to (E). (E) has already checked behind both sides to see if anyone has closed them down. (B) has closed (E) down and pressed the ball (as mentioned previously no tackling just shadowing) so (E) must turn AWAY from (B) get their body between the ball and the player as a shield and turn and pass to (A). So (E) has passed to (A). (B) recovers back as (A) passes back to (E). As (E) passes to (A), (E) must immediately look behind again both sides to both (C) and (D) to see their positions. This time (C) presses (E) so (E) must receive and turn AWAY from (C) and pass to (D). 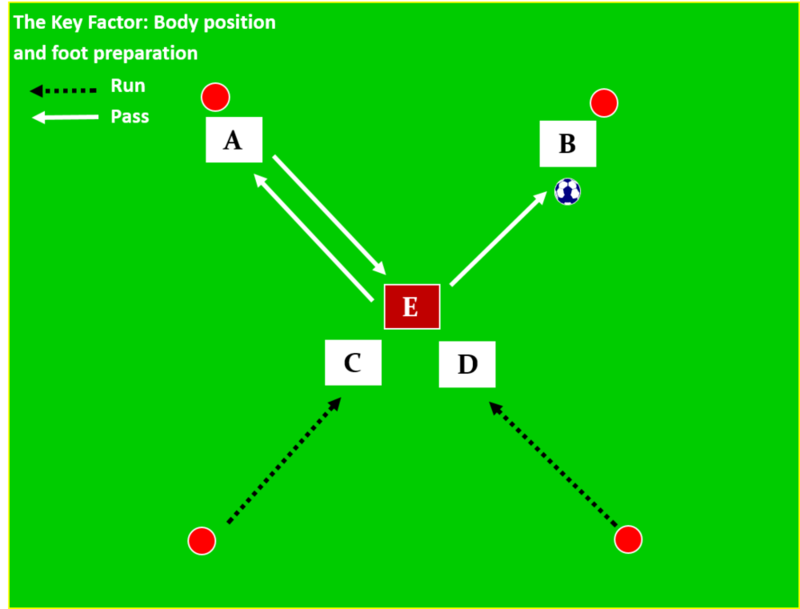 Both (C) and (D) press (E) so now (E) must pass back to the opposite player (B). (B) waits for (C) and (D) to recover back then passes to (E). In the meantime (C) and (D) may be making a different decision which in turn Causes a different decision from (E). (C) recovers back and (D) stays so now (E) must receive and turn and pass to (C). Always pass to the opposite player from the one who presses (E). More difficult now because EVERY pass is accounted for in terms of (E) having to make a decision and going both ways. 1. Use one or two balls per team for passing and moving (or more). You can keep it interesting by changing the theme for each awareness session e.g. passing to feet or space, opposite colors, receiving and turning, one touch / two touch, 1-2’s, crossovers etc. 1. One team inside, one team outside. A ball is with each outside player to begin. 2. Pass to an inside player who receives and turns and finds another outside free player with a pass. Then look to receive from another outside player. 3. The outside player receives and moves the ball side to side until another inside player is free to receive a pass. This ensures all the players are working both inside the grid and outside it. 4. Change the practice to all soccer balls starting with the inside players. These players now look to pass and receive a give and go from an outside player. 5. Rotate the players so both teams have the chance to play in the middle of the grid. Move both teams to the middle; divide the grid into two with each team passing to their own team within their own grid area keeping teams separate to begin. Inside team a ball each, look to find a free outside team player and pass to them. Outside player brings the ball back in, inside player moves outside the zone waiting to receive a pass from someone else. Set up second touch with a good first touch. Awareness of who is free to pass to. Work on a) first touch of outside player b) decision making of inside player in terms of when and where to pass and technique (quality) of pass. Get a turn in or dribble before passing. All in (many) touches, 3 then 2 touches. 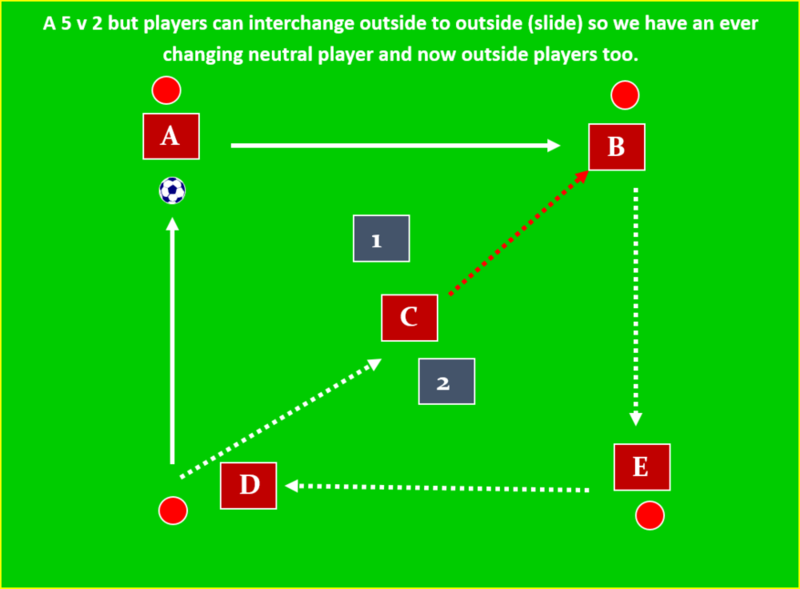 Play 1- 2 with inside player then go outside. Do a crossover with outside player rather than make a pass. Inside player passes to outside player and closes down quickly simulating a defensive movement, the receiver has to make a good first touch away from the pressure i.e. to either side of the pressuring player. It’s a good session because everyone is working but they get short intermittent rests, so maintaining quality. Players rotate around inside the grid in a random way receiving the ball and passing it back using various techniques. Each technique is practiced for a minute then the outside players switch with the inside players. Each player should get lots of work on the ball working on relevant techniques. One touch passing, 1 – 2’s. Numbers team can only pass to numbered players on the outside. Letters teams the same only passing to lettered players on the outside. Progression One: Play one v ones in the middle. Have it passive to begin the defending players shadow the attacking players as they receive and turn and move. Make it competitive. A lot of receiving and turning under pressure can occur now in the playing area. Progression Two: Have a 3 v 3 small sided game in the middle. The numbers game FORCES the players to look before they receive by the very condition placed on them. There are 6 Players and only 1 ball to begin. Players must pass in sequence i.e. 1 passes to 2; 2 passes to 3; 3 to 4 and so on to 6 who passes to 1 and we begin again. You can have player’s static to begin as easy introductions to the theme then have them passing and moving. In a roster of 12 players 2 groups of 6 can do this in different areas separately to begin. Player receives from the same person and passes to the same person each time. This develops great awareness of time, space and player positions. This is continuous work on and off the ball. Awareness of: where the player you receive from is and where the player you pass to is. Because of this players begin to anticipate the pass to them and where it is coming from. Also they must look to where it is going to (where is the player they are passing to?). We are trying to create a situation where players are looking two moves ahead not just one. For instance as (1) is about to pass to (2), (3) should be looking to support (2) for the next pass already, looking two moves ahead before the ball leaves (1). Likewise, (2) should already know where (3) is to pass to. Peripheral Vision Development results from this. Develop: Use two balls then three balls at the same time. Start with a ball at (1) and (5) then at (1), (4) and (6).To keep the sequence going players must move the balls quickly with few touches hence their peripheral vision development improves dramatically. As soon as they have passed one ball off the next one is arriving so quick thinking is needed to make the correct decisions. Now have 2 teams passing separately 1 to 6 in “each team”, with a ball each team in the same area. The example shows the passing of the numbers team, of course players will be moving but for the simplicity of the idea I show it this way. Develop: Count the number of passes each team get in a certain time frame adding a competitive element to the game. Who can get the highest number of passes made in a given time frame? Movement “off” the ball to open up angles for passes between other players. Communication verbally between players to help them identify where they are; passing player can call who they are passing to, receiving player can ask for the pass. Ensure players spread out throughout the area to have them playing both long and short passes. Encourage fewer touches on the ball at each reception to move it around the field more quickly helping players develop good transitional play. The actual game is played so quickly now they have to develop this talent as well as having good individual dribbling and turning ball skills. CHOOSE THE RIGHT PASS AT THE RIGHT MOMENT. PLAYER RUNS OUTSIDE THE AREA. PLAYER ON THE BALL MUST PASS TO THAT PLAYER AS SHOWN. This is a simplified set up to get initial understanding. Increase numbers as previously e.g. two teams of six. We started earlier with one ball and six players for example so each person on the ball had five choices of pass to make and that was easy. Player (1) runs outside the area (perhaps after several passes within the zone). Player (2) on the ball sees the run and must pass to (1). As (1) is about to receive (as the ball is traveling to him or her) (3) moves into a position to support (1) showing anticipation and awareness. (3) has already seen the run by (4) and passes. (4) Brings the ball back in and the game continues, (4) passes to (5) who has moved into position in anticipation and (5) passes to (6) who also has done the same. This is an indicator of how quickly players recognize the run and consequently make the pass. Hence players are beginning to look one and two moves ahead of the ball. It doesn’t need to happen so quickly in terms of the next player running outside but it serves as an example. The run can be likened to a penetrating run into the attacking third where the player hasn’t been picked up or tracked and is in a great position to attack and score if the passer sees them and makes that pass. Here we have two teams playing in the same area, player (5) passes to player (3). Player (2) as the ball is traveling runs outside the area, player (3) has to see this movement and make the next pass to that player. If (3) makes it with a one touch pass that is excellent as it shows they have seen the run as the ball is arriving and made the quickest pass possible to get the ball to (2). Player (2) then brings the ball back into play and the passing sequences start again. 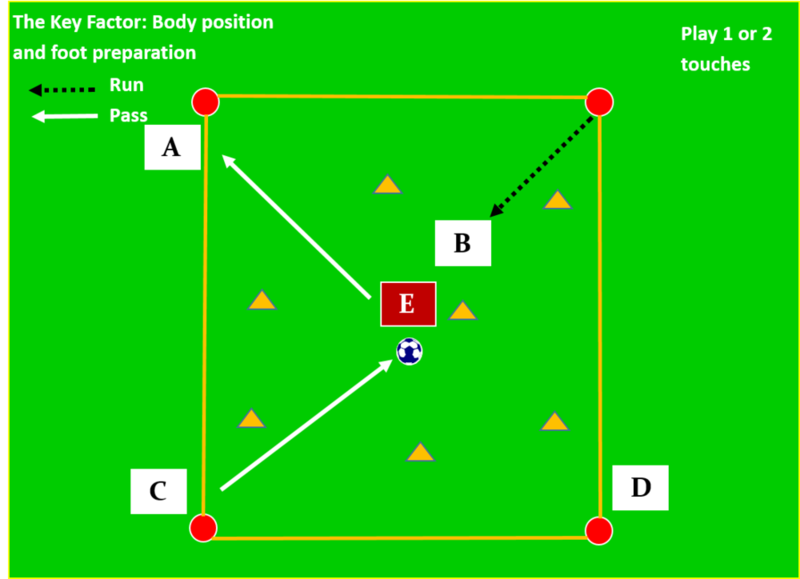 Likewise player (E) on the other team passes to player (D), player (C) runs out of the area and the set up continues. 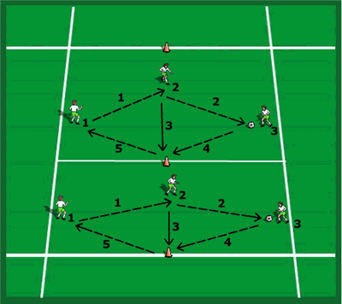 A ball each passing and moving playing 1 and 2 touches only. 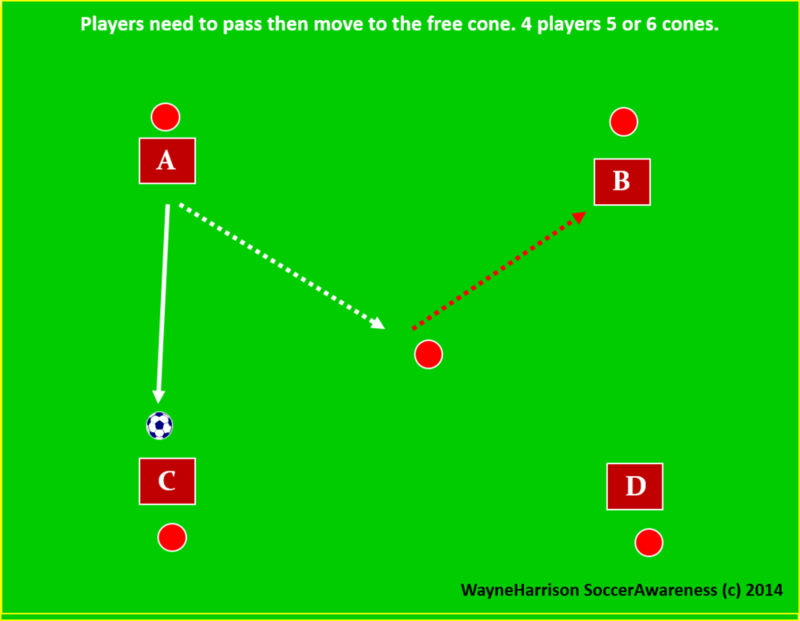 Avoiding the cones which represent opponents. Learning to position in the best space possible between cones. Restricted area to play in. Cones represent opponents so players must avoid passing close to them or positioning close to them. Blue cones the free players so always an overload. Now a REAL GAME SITUATION. Keeping score making it competitive working between restricted number of touches and unlimited touches to test players peripheral vision and awareness.